Absolutely safe, perfect for bathrooms and shower rooms! Mirror, glass, plastic, colored metal, stainless steel and others. * This mirror cannot to be attached to rough or frosted surfaces. 1. Clean surface before attachment from dirt, dust, water, oil, etc. and allow to dry. 2. 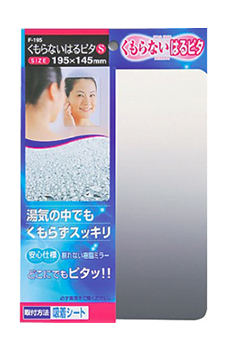 Remove protective film from the sticky side located on the back of the mirror. 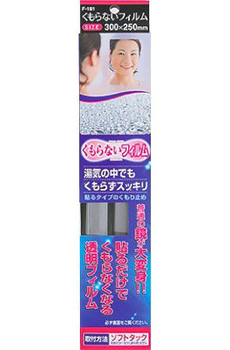 * The protective film can be separated easily by use of a usual adhesive tape. 3. Attach mirror plate to a flat surface tightly. 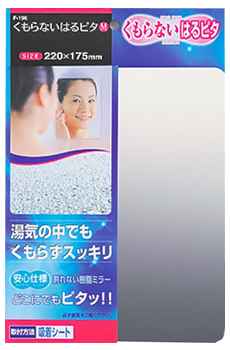 * Pollution or damage to the sticky side of the mirror effects the adhesiveness. Do not damage the white sticky side before attachment. * In the case that the white sticky side is dirty it is recommended to wash out slightly with soap, rinse with water and dry before use. 1. Avoid direct contact with boiled or hot water on the external surface of the mirror. 2. The anti-fogging effect will be stronger if you slightly wet the mirror surface with water (shower) or a wet sponge before use. 4. 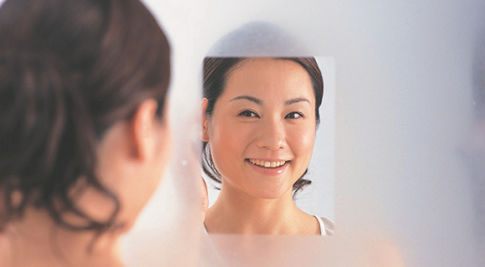 Pollution of the surface of the mirror negatively effects the anti-fogging effect. When cleaning the mirror use soap or neutral detergents with a soft sponge or a cloth. 5. Avoid getting water or detergents in the gap between the sticky side and an attached surface. 7. Don’t use gasoline, thinner or other organic solvents. 8. In case of getting hair-dye, bleach and other alkaline chemicals on the mirror surface immediately wash away them with just water. 9. 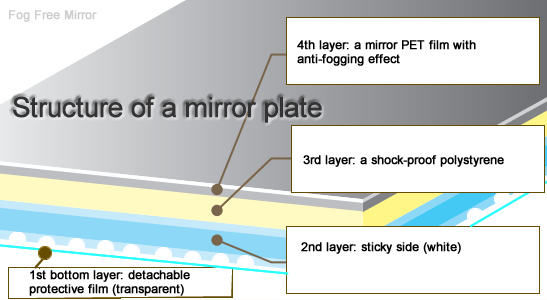 Don’t use extra aerosols or liquids to prevent mirror fog. They won’t be effective because of the special anti-fogging coating. Mirror doesn’t fog in the steam! Easily sticks on an existing mirror! Sticky side film with weak type of glue, doesn’t leave traces on removal! 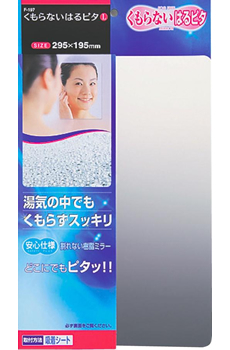 Absolutely safe, perfect for mirrors in shower or bathrooms! – Simple and fast to attach by a sticky side on the back surface of the film. 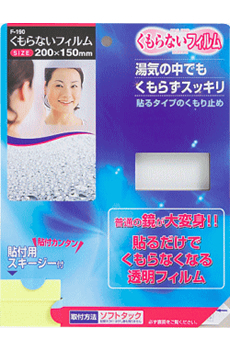 *There are also an aerosol and the liquid preventing mirror fog.